Toolbar in Excel | How to Customize the Toolbar in Excel? How to Use the Toolbar in Excel? 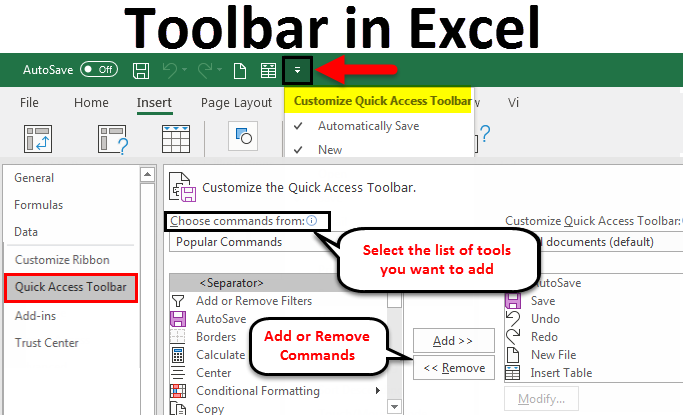 The Toolbar is an area where you can add different commands or tools associated with excel. By default, it is located above the ribbon with different tools and is visible in the upper right corner of the Excel window. To increase the customer friendliness toolbars have become customizable according to the frequent use of different tools. 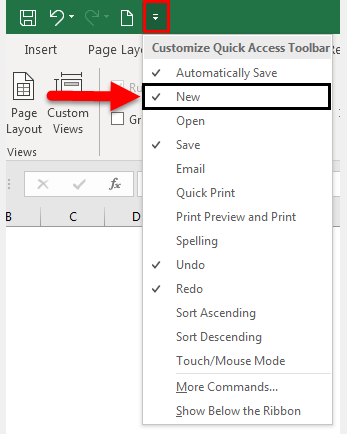 Instead of a set of tools excel gives us the option, to select and build a Quick Access Toolbar. This makes quick access to the tools that you want. So the toolbar is popularly known as Quick Access Toolbar. It is a symbolical representation of built-in options available in Excel. By default, it contains the below commands. Save: To save the created workbook. Undo: To return or step back one level of an immediate action performed. Redo: Repeat the last action. The Toolbar in Excel is a shortcut tool to avoid searching for the commands you often use in the worksheet. 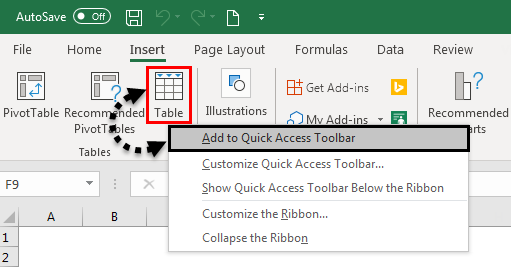 Using Toolbar in Excel is easy and it helps us simplify access to the document’s commands. Let’s understand the working of the Toolbar in Excel by some examples given below. 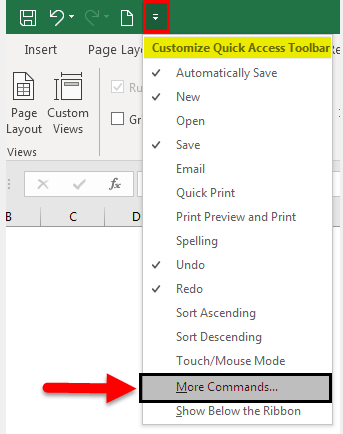 To get more tools you have the option to customize the Quick Access Toolbar simply by adding the commands. From the dropdown, you will get a list of commonly used commands. Click any of the options that you want and it will be added to the toolbar. New command is selected and this will be added to the toolbar highlighted as the command is added with already available tools. In a similar way, you can add the tools which you want to access quickly. So instead of clicking and finding the tools from the multiple hierarchies, you can access the option within a single click. There are options to add more tools Instead of the listed commands. You can add more commands to the quick Access Toolbar by selecting More Commands. Click on the downward facing arrow at the end of the toolbar. Select the More Commands option. 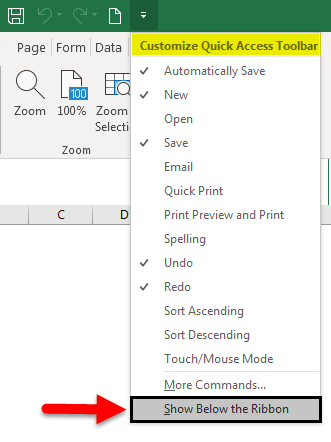 You will get a new window which gives you all the options available with excel to add to your toolbar. From the Choose commands from the drop-down, you can select which list of tools you want to add. Each list will lead to a different list of commands that you can add to the toolbar. Once you add the command it will appear in the list next to the add button. This is the list of tools added to the Toolbar. 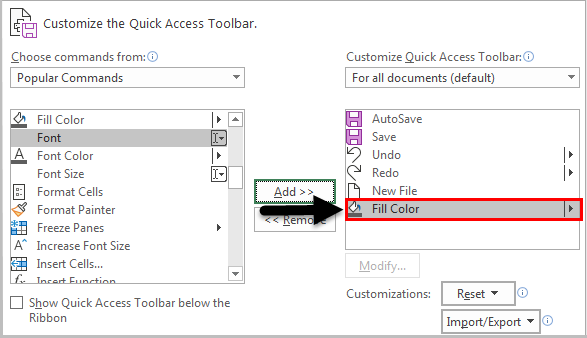 The “Fill Color” command will be added to the Customize Quick Access Toolbar. You can see the “Fill Color” command is added to the Quick Access Toolbar as below along with the existing commands. Since this is the last item added to the Quick Access Toolbar, it will appear in the listed order. To reorder the added items, you can use the up and down arrow which is highlighted right to the list of items. Select the command which you want to reorder or change the position. 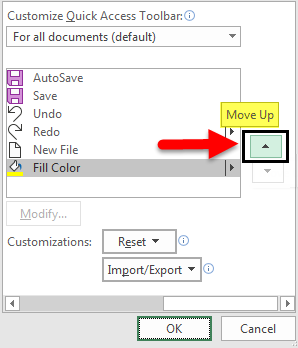 By clicking the Upward arrow, the “Fill Color” command is moved upwards in the list shown as below. By pressing the OK button the selected format will be applied to the Quick Access Toolbar. The “Fill Color” Command is visible before the “New File” Tool. You can see the visibility order of the listed tools is changed. According to the new list order, the position of the “Fill Color” has been changed to the second last from the end. The commands can be removed from quick access toolbar if you are no longer using it or not using frequently. The commands can be removed in a similar way how you added the commands to the Quick Access Toolbar. You will get a new window which will show the already added commands on the right side. This is the list of commands which are already in the quick access toolbar. 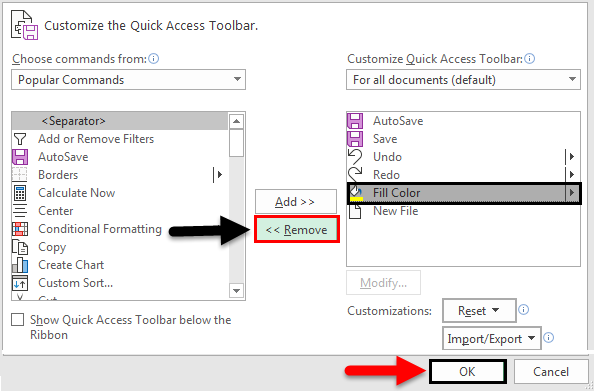 Select the command which you want to remove from the quick access toolbar. In the center, below the add button, a Remove button will be enabled. Press the OK button to make the applied changes. 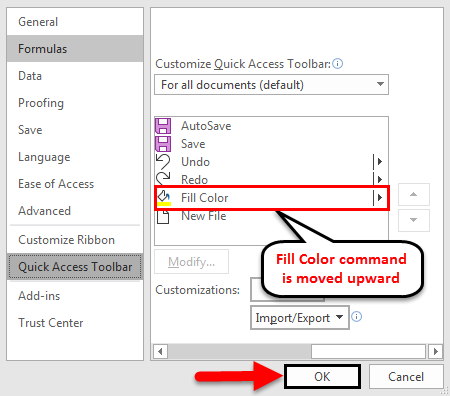 The Fill Color command is removed and it will be disappeared from the Quick Access Toolbar as shown below. According to your convenience, you can change the position of the toolbar. You can change the position from top to below the ribbon or vice versa. Select the downward facing arrow at the end of the toolbar then select the Show Below the Ribbon option from the list. Now the Toolbar is moved below to the ribbon. 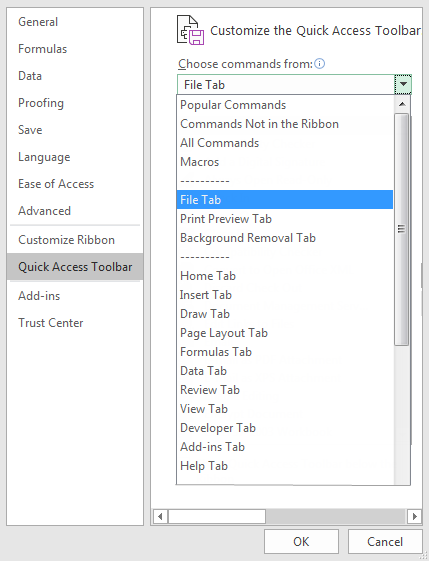 Right click on the tool within the ribbon which you want to add to the Toolbar in Excel. You will get the option to Add to Quick Access Toolbar. Here we right clicked on the Table tool to add from the insert command. The command will be added to the Quick Access Toolbar as below. Similar to the name Quick Access Toolbar, this is a customizable toolbar to access the tools easily. It is possible to add any of the available commands in excel to the Excel Toolbar. The visibility of the toolbar can be set above or below the ribbon. 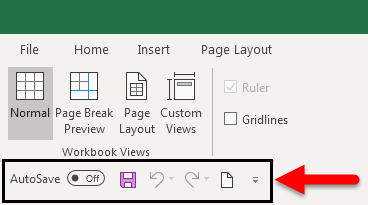 Just through a right click, you will get the option to add most of the command to the Toolbar in Excel. How to Insert New Worksheet in Excel?